It appears to feed exclusively on a type of plastic used widely in plastic bottles. RESEARCHERS IN THE US and Britain have accidentally engineered an enzyme which eats plastic and may eventually help solve the growing problem of plastic pollution, according to a new study. 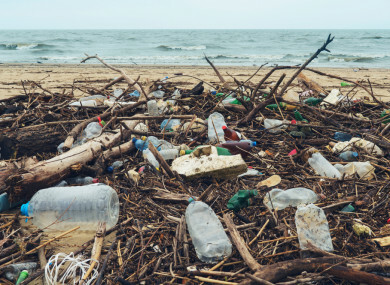 More than seven million tonnes of plastic are dumped into the world’s oceans every year, and concern is mounting over this petroleum-derived product’s toxic legacy on human health and the environment. Scientists at the University of Portsmouth and the US Energy Department’s National Renewable Energy Laboratory decided to focus on a naturally occurring bacterium discovered in Japan a few years ago. The researchers’ goal was to understand how one of its enzymes – called PETase – worked, by figuring out its structure. “But they ended up going a step further and accidentally engineered an enzyme which was even better at breaking down PET plastics,” said the report in the Proceedings of the National Academy of Sciences, a peer-reviewed US journal. “Serendipity often plays a significant role in fundamental scientific research, and our discovery here is no exception,” said study author John McGeehan, professor in the School of Biological Sciences at Portsmouth. Although the improvement is modest, this unanticipated discovery suggests that there is room to further improve these enzymes, moving us closer to a recycling solution for the ever-growing mountain of discarded plastics. Email “Scientists have accidentally created a mutant enzyme that eats plastic ”. Feedback on “Scientists have accidentally created a mutant enzyme that eats plastic ”.